Improve food quality and reduce risk of contamination by draining vegetables or fruits, thawing frozen meat or poultry or storing seafood on ice. 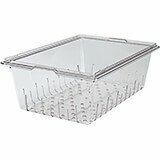 Fits Camwear Food Storage Boxes 18" x 26" x 6" and deeper. Improve food quality and reduce risk of contamination by draining vegetables or fruits, thawing frozen meat or poultry or storing seafood on ice. Virtually unbreakable, easy to clean. Colander Pans allow juices and moisture to drain quickly.Camwear Flat Covers, Covers with Handles and Notched Covers with Handles fit on pans with colanders. 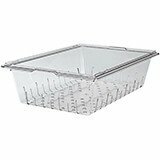 Fits Camwear Food Storage Boxes 18" x 26" x 9" and 18" x 26" x 15". Improve food quality and reduce risk of contamination by draining vegetables or fruits, thawing frozen meat or poultry or storing seafood on ice. Virtually unbreakable, easy to clean. Colander Pans allow juices and moisture to drain quickly.Camwear Flat Covers, Covers with Handles and Notched Covers with Handles fit on pans with colanders. Kit includes: One 8" Deep Colander; One 18" x 26" x 9" Camwear Food Box; One 18" x 26" Sliding Lid. 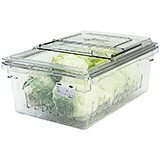 Improve food quality and reduce risk of contamination by draining vegetables or fruits, thawing frozen meat or poultry or storing seafood on ice. Virtually unbreakable, easy to clean. Colander Pans allow juices and moisture to drain quickly.Camwear Flat Covers, Covers with Handles and Notched Covers with Handles fit on pans with colanders.